thunderstrokes: Are we supposed to recycle everything now? 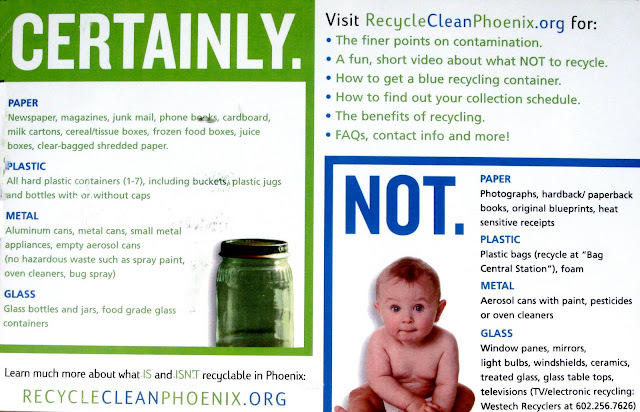 Now, I realize that the list of what can be recycled includes items that might be surprising to some people, but was it really necessary to remind us to not recycle the babies? Are people actually trying to do this? Why is there a baby on this card? I'm guessing that it's because they don't want you trying to recycle used diapers, but that's not even mentioned on the list of "Nots." Did they want to draw our attention to the "Nots" by luring us with an image of a cute baby? Even the baby has a 'surprised to be here' look on his face. Citizens of Phoenix and elsewhere, please be advised that no municipality is currently accepting babies with other recycling material. Your best bet is to try again, and hope the next one turns out better. the real question is... can you recycle the recycle cards?